As a part of the Hyatt Regency chain of hotels, guests can expect nothing but top notch amenities and customer service when visiting this unique resort. Tucked away on 22 stunning acres in the Monterey Pines in California, yet still within reasonable distance to the Monterey airport, the downtown area and the many tourist attractions in the area. This hotel features over 550 deluxe rooms in different categories plus an abundance of meeting and event space for any special occasion or work related conference. The on-site dining is spectacular and provides guests with plenty of options for all meals of the day. With an array of activities to take part in, guests will never find themselves bored and yet still have plenty of time to lounge poolside, if they so choose, at one of the two outdoor swimming pools. A world class spa provides guests with pampering treatments, while the on-site championship rated golf course provides golfers of all levels with a round of golf at their doorstep. There are packages and promotions always available which guests can elect to reserve to enhance their stay even further. Hyatt Regency Monterey is perfect for travelers with all purposes, from singles to families as well as business travelers looking for quiet work space. 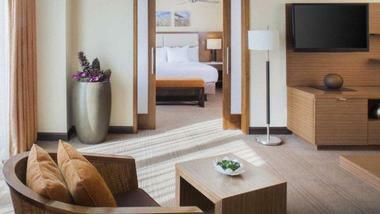 With over 550 rooms and suites to choose from, there is definitely a room to accommodate every need and preference. The room categories are Standard, Accessible, View, Suites and Villa. When selecting any room or suite at Hyatt Regency Monterey Hotel, guests can expect high speed wireless Internet service, high quality Hyatt Grand beds, luxurious bath towels and amenities, rain showers, and high definition televisions. The Standard rooms are great for the budget conscious traveler. They are available with either two double beds or one king size bed. Each of these rooms comes equipped with a 42” flat panel television, a private bath, and is decorated in neutral, soothing tones. The materials used within the rooms are made to reflect nature. These rooms will accommodate a maximum of four guests, with a roll away bed available upon request and at an extra charge. The Accessible rooms are compliant with the Americans with Disabilities Act and feature an array of accessible features from wide doorways in the bath area, an accessible tub, closed captioning television and a strobe light fire alarm system, along with the same high quality features of a Standard room with two double beds. The full list of ADA features is available on the hotel’s comprehensive website as well. The View rooms at Hyatt Regency Monterey Hotel boast views of either the Spy Glass Pool or the Pebble Beach Del Monte Golf Course. The golf view rooms are available with either a King size bed or two double beds and the King size rooms are also available with a balcony. The pool view rooms are also available with either a King size bed or two doubles and the king with or without a balcony. These rooms are much like the Standard rooms, with soothing neural tones and an earthy feel to the room as well as luxurious amenities in the bath. The Suites are a more spacious option for guests looking to stretch out a bit more. They are approximately 685 square feet of space and are available with one king bed or two doubles. Each suite boasts one and a half bathrooms, a comfortable sitting area and parlor. The bedroom is separate from the living areas for additional privacy. The Hospitality Suite is slightly larger and boasts a dining table suitable for up to eight guests, two sofas in the parlor, wet bar and patio. This suite is perfect for entertaining. Guests will have plenty of space for their belongings in the connected bedroom with walk-in closet. The President’s House is the property’s ultra-luxurious villa with over 2500 square feet of space. There are an amazing four bedrooms and four and a half baths plus a living room, a dining room, a full, top notch kitchen and private backyard with a pool. This villa is a getaway within a getaway. Guests will still have access to all the amenities the hotel offers, plus the added privacy and seclusion of a stand-alone villa. There are sleeping quarters for up to eight guests, plus separate space to host special occasions, functions or meetings. The backyard patio is completely enclosed and private for lounging or hosting private gatherings poolside. The kitchen is fully equipped so guests can jump right in to creating their own cuisine as well as crafting their own delicious cocktails at the wet bar. This villa comes with two gas fireplaces to cozy up next to on a chilly evening, as well as a Bose Surround Sound System for entertainment. 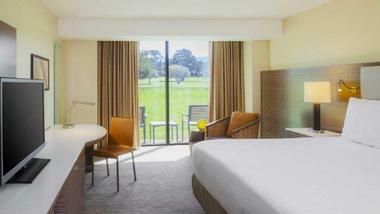 This villa will provide guests with the ultimate visit at the Hyatt Regency Monterey. 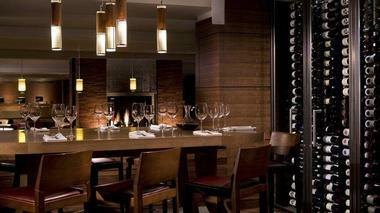 There are a few dining options at Hyatt Regency Monterey Hotel, which will be sure to please any palate. The TusCA Ristorante is the main restaurant which serves breakfast, lunch and dinner daily. Breakfast consists of classic breakfast favorites but also incorporates signature selections such as Chilaquilas or the Asparagus and Lump Crab Omelet. The menu offers delicious selections such as salads, soups and sandwiches to handmade pizzas and fresh made to order burgers. Dinner begins at 6 p.m. until 9 p.m. from Tuesday to Sunday. Hearty selections such as steak entrees, salmon dishes and chicken breast are available, as well as fresh made pastas and gourmet pizzas. 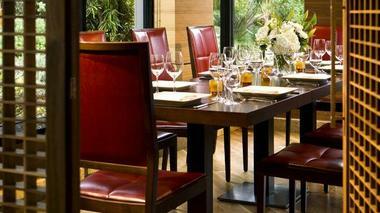 Seasonal choices are always available as well as an extensive wine menu to compliment whichever dish guests choose. Knuckles Sports Bar is a family friendly establishment which is much more than a bar. The menu is creative and innovative and takes all family members into consideration. Free popcorn is served to all guests dining or enjoying beverages at Knuckles. There is even a kids gaming area. Delicious menu options at Knuckles include Beer & Cheese soup, Surf & Turf Burger, Blueberry Chipotle Pulled Pork and even hearty steak entrees. There are a number of foot long hot dogs on the menu as well. The Fireplace Lounge is the perfect place to kick back and enjoy a bite to eat as well as a cocktail or beer. The menu consists of a selection of both lighter fare as well as hearty entrees to fill guest’s bellies, including a Gorgonzola Mac and Cheese made with bacon and ham and served with a jalapeno cornbread. Room service is available should guests wish to enjoy in-room dining for added privacy and relaxation. Knuckles Sports Bar is a favorite hangout for guests looking to mingle, catch the game or just enjoy a few drinks. There are 24 flat screen televisions so guests won’t miss any of the important sports events going on. Although it is a family-friendly establishment, it is still fun for adults alike. There are pool tables to shoot a few games while enjoying a cocktail. The drinks menu offers a great selection, something for everyone, which is part of the reason why Knuckles has been voted the best sports bar on the Monterey peninsula for the past 13 years. The chef, Matthew Brady, has come up with a fun promotion called The Hot Seat. He selects one seat prior to opening and whomever sits in that seat will have their tab picked up by the chef. It happens twice a week. The Fireside Lounge is a quieter, more relaxed atmosphere to enjoy drinks sitting by the majestic fireplace or just in a comfortable leather arm chair. The drinks menu offers an array of beers, ales, and cocktails plus a very detailed wine selection with reds and whites categorized by intensity. On Friday and Saturday evenings, guests will enjoy the live jazz entertainment at the Fireside Lounge. If guests are looking to enjoy a fine glass of wine, they can head to TusCA Ristorante which has its own wine cellar and complimenting menu. There is an extensive collection of different California wines plus a few international selections. 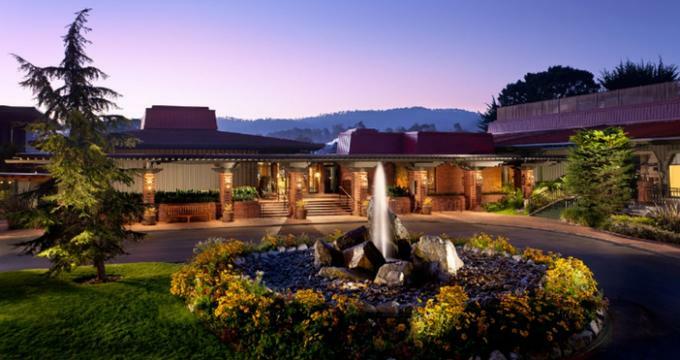 The Marilyn Monroe Spa is the on-site spa at Hyatt Regency Monterey Hotel. It is designed to make guests feel as though they are visiting the late starlet’s home. The atmosphere is a little different from traditional spas with serene, neutral colors and earthy tones since it is very vibrant and playful much like Marilyn was. The services offered at the spa include walk-in rain showers, suites with luxurious soaker tubs, rooms made for just couples, and even a library. The Glamour Room is the place to head for facials, manicures and pedicures while massages and body wrap services are provided in private treatment rooms. The spa also has a make-up room, much like Marilyn’s own, where they can get made up for an upcoming evening out as well as having their hair done in the full service salon. Pebble Beach Company’s Del Monte Golf Course is steps away to accommodate the golf lovers. This course is the oldest course still in operation west of the Mississippi. It has played host to many professional golf events over the years. This course is great for golfers of all skill levels since there are differing tees for each level. It is 18 holes and a par 72. Guests staying at the Hyatt Regency will receive a special discounted rate for their round of golf and can reserve tee times up to 60 days ahead of time. Guests can also book private or group lessons at Del Monte. The on-site pro shop has apparel, golf equipment and merchandise available for sale. The wedding planners at Hyatt Regency work very hard to create custom wedding packages for every couple wishing to experience their wedding day at the hotel. Packages could include rehearsal dinner, wedding shower, and bridal brunch. 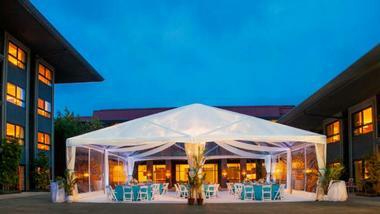 With over 40,000 square feet of event space, there is a venue perfect for every size of event. Special pricing is offered to guests of the wedding who book their stay at the hotel as well. The setting and atmosphere is perfect at the Hyatt Regency to create a memorable, magical day. For meetings and conferences, there are many different venues to choose from depending upon the size of group that will be attending. Again, the events staff will work one on one with each person to arrange and plan out a seamless event or meeting. There are high end audio visual aids at the disposal of each group, along with customized catering to feed the attendees. The planning staff can also assist in planning team building activities off-site in the area. Hyatt Regency Monterey strives to reduce their environmental footprint as much as possible with practices such as lower level lighting in use, the reuse a towel program for guests wishing to participate and having air conditioning units which do not go below 65. There are also electric car charging stations on-site for guests who require them. Because the hotel is within close proximity to the airport, guests can take advantage of the complimentary airport shuttle, which takes the worry out of transportation to the hotel. Guests will have access to the 24 hour a day fitness center as well as the business center to handle all work needs while visiting. There are many packages which guests can book, from activities to spa treatments and even dining options, there is something for everyone. If guests are members of the Hyatt club, there are also double points offers available or even discounts. 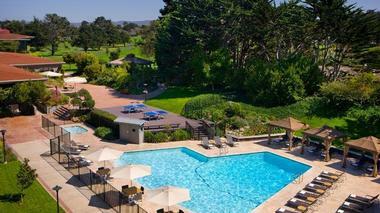 The Hyatt Regency Monterey is a pet-friendly hotel, allowing dogs up to 50lbs. or two dogs at a combined weight of 75lbs. per room for an additional charge. The maximum allowable nights for pets is six nights for $100. If more nights are required, seven to 30 nights is $100 plus an additional deep cleaning fee. There are plenty of activities both on-site and in the nearby area for families and children to enjoy. There are two swimming pools on the property, which children of all ages will love. For parents looking for an evening out, the concierge has a list of babysitting services available nearby. There are several different types of rooms which would accommodate small families.